Find My iPhone catches a home invader, iPhone celebrity intrigue in Nigeria, and more trouble on the Letgo app. The latest in an occasional AppleInsider series, covering the latest in Apple-related crime worldwide. 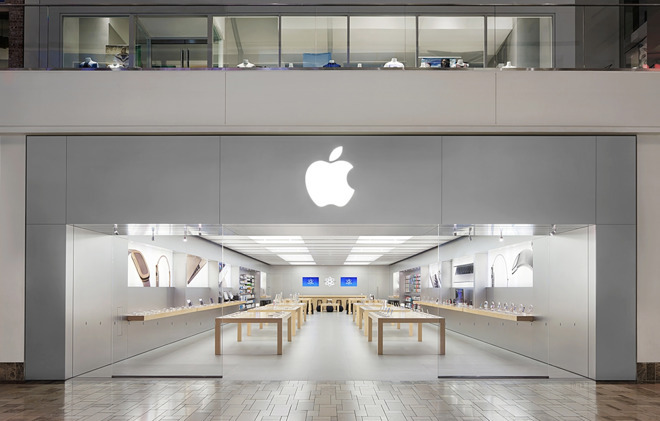 While there have been dozens of thefts at Apple Stores in California in the last six months, very few of them have led to arrests. But in an exception to the rule, three men were arrested after such a theft in Roseville, Calif., on Wednesday. The Sacramento Bee reported that the latest theft took place at the Roseville Galleria Apple Store Wednesday —at the same time Apple was announcing new iPhones about 150 miles south and west —and the suspects fled in a car. That car got into two separate crashes, at which point two of the suspects fled on foot. Two were arrested after fleeing while the third was apprehended at the scene of the crash. Law enforcement wasn't sure whether or not this theft was connected to the others in the state. The Roseville Apple Store was robbed for the fifth time this year, and the third time in four days. A flight from Oakland to Hawaii was delayed earlier this month after several passengers received what looked like a grisly crime scene photo via Airdrop. According to Buzzfeed, 15 passengers received the photo on their devices as the flight was taking off, leading to a delay as some on board were concerned it was a threat. It turned out the photo was from biology coursework belonging to a 15-year-old on the flight, who was attempting to send it to her mother. In an unrelated incident after the flight took off, a can of pepper spray popped open and filled part of the plane's cabin. The thieves of the world by now should know that if they steal an iPhone, they probably won't be able to unlock it, but they can still be tracked with it. An accused thief in Spokane, Wash., found that out the hard way when, police say, he committed a home invasion that included the theft of an iPhone. According to KXLY, police immediately activated Find My iPhone and found the phone, along with the suspect, in a nearby alley. The Nigerian actress and Instagram comedian known as Wofaifada recently had her iPhone 7 stolen and talked about it on Instagram. According to Nigerian website Naija, a local sports reporter criticized the performer for the post, stating that "u don't have to tell us it's an iPhone 7. Madame get urself another phone, ppl steal phones everyday and pple lose phones everyday." This led to a response from Don Jazzy, the head of Maven Records, who denounced the sports reporter as "daft." A coffee shop assistant in Petaling Jaya, Malaysia, has been arrested for using counterfeit money to purchase an iPhone X. According to NST, the man has pled not guilty to passing RM100 in counterfeit notes to purchase the phone. A former financial assistant in the Department of Chemical Engineering at Penn State University has been caught illegally buying a MacBook Pro with university funds. According to Centre Daily, the 43-year-old woman bought the computer for a graduate student and accidentally ordered a second one, which she sold on Craigslist, pocketing the money. She was charged with theft by unlawful taking, receiving stolen property, and criminal use of a communication facility. A 12-year-old boy in Texas who had somehow received a stolen iPad contacted the woman from whom it was stolen in a break-in three years earlier and offered to return it. According to the Reporter News, it's not clear how exactly the boy obtained the iPad. An employee at Chuck E. Cheese in Athens, Ga., had his iPhone 8 Plus stolen from him at work. According to Online Athens, the employee was fixing a game and set down the phone on top of it, just prior to the theft. Man steals iPad to "escape wife"
A man in Jinhua, China said he stole an iPad in order to be arrested and therefore escape his wife. According to the Global Times, the man stole the iPad from a former workplace and waited for police to arrest him. "I wanted to get arrested so I could get some quiet for a few days," the man told police. Police in Sioux Falls, S.D., have busted a ring that stole various items from cars in the area. According to KELO, the Minnehaha County Sheriff's Department found property taken from more than 20 vehicles, and it was tracking of the stolen iPad among the items that led them to a home. It contained both the three suspects, as well as the stolen items, which also included hunting gear, purses and credit cards. It's possible that attempts to sell iPhones or other expensive items via the app letgo have gone off without a hitch, but once again that kind of transaction has ended up in the news as a theft. A Houston man made arrangements to sell his old iPhone via letgo, but after the buyer changed the location several times and asked for the serial number, the buyer grabbed the phone and ran away, Click 2 Houston reported.